Ask anyone over the age of 5 and they will tell you that Jesus Christ was born on December 25th in the year AD 1. Well no actually, the year at least is wrong. How can that be when our calendar began as Anno Domini , in the year of our Lord ? Its always a bit tricky to age things precisely when we’re talking about 2000 years ago but one fact that we do know is the death of King Herod in 4 BC. Herod was known as ” a madman who murdered his own family and a great many rabbis “, but also for his purge of the infants due to his fear of being supplanted by the coming of the” King of the Jews “. Jesus and his parents escaped Herod’s murderous clutches but this story shows us that Christ must have been born before 4 BC. Another significant part of the story is the Star of Bethlehem which appeared mysteriously at the time of Jesus birth. Some people have suggested that this could be the result of a supernova explosion or a particularly bright comet appearing. Whilst this argument fits with the sudden appearance it falls down in one vitally important respect. The Three Kings who visited Jesus were astrologers who were guided by the Star and as they were known to have travelled some considerable distance from the East, the appearance of the Star of Bethlehem would have to be something that could have been predicted beforehand. A predicted appearance of a comet or a supernova would have been beyond the technology available to astrologers at the time. What they would certainly have known about was the Great Conjunction of 7 BC. A Great Conjunction is a conjunction of the planets Jupiter and Saturn. Great Conjunctions take place regularly, every 18–20 years, as a result of the combined 12-year orbital period of Jupiter around the Sun, and Saturn’s 30-year orbital period. A Greatest Conjunction is a conjunction of Jupiter and Saturn at or near their opposition to the Sun. In this scenario, Jupiter and Saturn will occupy the same position in right ascension on three separate occasions over a period of a few months. Such tripled occurrences are actually known as triple conjunctions. In 7 BC there was a Greatest Conjunction, in fact Jupiter and Saturn were together in right ascension and zodiacal longitude. A conjunction of planets occurs in the Zodiac, but this is only in one plane, the two planets could still be some considerable distance away from each other, one above the other in the night sky. A conjunction in right ascension and zodiacal longitude is much rarer and would give the appearance of the planets being virtually on top of each other. It is like an eclipse of the Sun or Moon as opposed to a normal conjunction. Jupiter is, as a rule the brightest star in the sky but Saturn is also bright so the two coming together as one would create a level of brightness that would be unheard of. The other factor is that people 2000 years ago would have an intimate knowledge of the heavens unlike today when the vast majority of humans scurry around chasing their own notions largely unaware of the vast theatre that is played out above them on a nightly basis. In ancient times the position of the stars would be the nearest thing most people had to a compass and a watch so they would know about any anomalies. Astrologers in those days were the wisest people on Earth. The Three Kings would have known about this Jupiter / Saturn conjunction for many years. They would also have known that it was no ordinary Great Conjunction because of its rarity. Jupiter and Saturn are the two planets that rule the affairs of the world of politics so such a phenomenon would be exactly what they spent their lives looking for. To see things the way the Three Kings saw them its important to have some insight into the astrology of the day. Everything in human experience was attributed to the symbolic rulership of one planet or another. Jupiter rules kings, that was taken for granted but each planet would also rule different races. Saturn was said to rule the Jews, so this exceptional conjunction of Jupiter and Saturn would herald the coming of the King of the Jews. This was no doubt why Herod got so wound up, because of course he would have had his own astrologers. The conjunction lasted for over 6 months from late May to early December but The Kings would know that the most important moment would come when Jupiter and Saturn were opposite the Sun. This would occur in the third week of September. At this point people might ask how the Three Kings knew where to look. The quaint idea that The Star stood above Jesus manger like an arrow pointing downwards makes no sense as we know that if you move towards a star in one direction it will itself appear to move, so a search based on that method alone would be like chasing the end of a rainbow. The conjunction occurred in the sign Pisces and the particular area of Palestine that Jesus was born in was ruled by Pisces, so the Three Kings were up and running. No doubt they had more sophisticated methods of determining the exact place either through a form of ancient astrocartography or through their own divination. Its most unlikely that such eminent persons would undertake such a journey only to get to the wrong place like in the opening sequence of Monty Python’s Life of Brian. Jesus Christ’s chart would therefore have the Sun in Virgo opposite a Jupiter / Saturn conjunction in Pisces. The story of Christ’s birth suggests he was born at night time with The Star of Bethlehem high in the night’s sky. A chart for a little before midnight would make sense because the Sun would be in the 4th house and Jupiter and Saturn would be in the 10th. The 4th house rules the home, family and basically where we come from in life. With the Sun in Virgo in the 4th we can see the lowly humble origins of birth in a stable. The 10th house is the peak of the career, basically where we go to and Jupiter in Pisces there would show someone who is born to become King of the Jews. Saturn’s position right on top of Jupiter, however suggests a great fall. The two together point to the crucifixion of the King of the Jews. A birth time of around 11.30 pm would tick all these boxes and would also give an Ascendant of early Cancer. Another important symbolic feature is the story of the Virgin birth – what better way to symbolise this than to have the Sun in Virgo ( the sign of the Virgin ) in the 4th house ( of the mother ). So Virgo, it is then but why has the Church always celebrated Christ’s birth in Capricorn. The answer is quite simple, in the early days of Christianity, it was felt that it would help establish the Church if the primary date of celebration was soon after the Winter Solstice. Something is certainly needed at that point in the year’s cycle and the festival of Saturnalia was already commonly celebrated then so Christianity placed Christ’s birth at this time and gradually absorbed the pagan ceremonies until Christmas became established. So which day during the 3rd week of September 7 BC ? The moment that makes most sense from an astrological point of view would be 11.30 pm on September 15th. This would place the Moon in Cancer conjunct the Ascendant and part of a Water Grand Trine that includes Uranus in Pisces and a Venus / Neptune conjunction in Scorpio. Christ’s message to humanity was one of loving kindness, compassion and devotion to the God – the closest astrological symbol to this is Pisces and Neptune its ruler. Humility, self sacrifice, service to others and even the washing of feet come under the Piscean symbolism particularly when the purity of Virgo is involved as well. The notion of walking on water translates to having transcendent control over the emotions and a Grand Trine in Water with the Moon rising in dignity in Cancer is the most appropriate symbol for this. The Sun’s conjunction with Pluto at the base of the chart means that Christ is asking for us all to make the deepest and most profound transformation possible. This chart is utterly unique particularly when we consider the role of the Greatest Conjunction of Jupiter and Saturn. The closest comparable chart that Capricorn Research has seen is that of the current Dalai Lama who is also a double Cancer with Virgo and a Grand Trine in Water. Certainly of all the beings alive today, the Dalai Lama is the only one that could come close. There are no doubt many people who would view it as sacrilegious to put forward an astrological chart for Jesus. 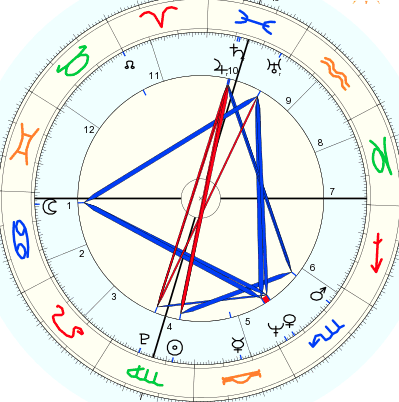 Of course no chart could possibly capture or portray the essence of Christ but there obviously was a man called Jesus who lived on Earth and was born at a certain time so there has to be a birth chart for that moment. Having looked at all the evidence, Capricorn Research has come up with this moment as the one most likely that God became Man. Thats interesting thanks very much. A few days later with Moon in Virgo would still fit, although the Sun’s opposition to Jupiter and Saturn would be weaker. Jesus is a Pisces. Even if you wanted to use that Revelation scripture for interpretation. Having Sun and Moon at the feet not head would figuratively suggest the sun at moon are at the bottom of the Virgo -Pisces axis, so Pisces. Thanks James. When thinking about a chart like Jesus you have to think in the way the astrologers of the time would have thought. To them Jupiter and Saturn were the most important planets and they are conjunct in this chart at the Midheaven in Pisces. So Jesus IS the representative of Pisces. His Sun in lowly Virgo in the 4th house opposite this conjunction shows his humble beginnings. There are many authenticated sources for the validity of Christ’s birth and resurrection, than any historical figure in antiquity……….But unless you are born again in the spiritual sense, then the god of this world will keep you blinded to the truth and love of Christ. Thanks Steve. I have no doubt Jesus recognised his true self. But the question is – do we ? Dr. Earnest Martin, author of The Star that Astonished the World, calculated the exact date of Jesus’ birth as September 11, 3 BC, sometime between 6:18 and 7:45 PM, based on Revelation 12:1, Genesis 49:10, and astronomy. Many other biblical astronomers agree on this date. Jupiter is in Leo conjunct the Royal Star Regulus. He says Herod died soon after eclipse. He didn’t say Herod’s funeral arrangements were completed soon after the eclipse. So on this basis the 4 BC date makes the most sense. There is a lot more information in the book, that may or may not change your mind. For me the important thing is that the celestial events explained in Rev 12 has to be in place for Jesus’s birth. Thanks Steve, for me the most important thing is that his chart contains all the symbolism of his life. Also the Star of Bethlehem has to be significantly different to the normal run of things. It also has to be something that the three wise astrologers could use to predict where to find him. All of this occurs with the Jupiter / Saturn conjunction and parallel in Pisces of 7 BC. Jupiter conjunct Regulus in Leo does not tick any of the boxes that would lead the astrologers to Palestine. Until I see a chart that does it better, Im sticking with his one. I could replicate your chart only on 17 Sept 0007BC at 23:30. Is there a typo? Thats interesting thanks. Ancient sources are no more reliable than any others. This article is written based on an obsession with Mars being at the 18 degree of Libra referring to crucifixion ordered by the emperor. The writer neglects to point out the such crucifixions were going on every week anyway. So what has happened here is that various charts have been put forward that are shoehorned into the assumption that Mars must have been at 18 Libra for Jesus death which is illogical and ridiculous. There is no way the Star of Bethlehem could have been Regulus because this was not an unusual event, it was always there. And even if it was, Regulus could not be conjunct the Sun at the time because it would not be visible to the three Kings or to anyone else. On top of that there is nothing in any of these charts that symbolically chime with the life and personality of Jesus. Read the old texts by all means, but use some discrimination of your own whilst doing so. 1) “The writer neglects to point out the such crucifixions were going on every week anyway” – Julius Firmicus Maternus refers to “order and presence of emperor”. If emperor have chance personally order all crucifixions in empire, he would spent all his time of life to make crucifiction orders only. If emperor have chance be personally present on each crucifixions he would not survive. Also, note that Mars in 18 degree of Libra is 1 day in 2 years. So, it is clear that Firnic point out on really unique event. 2) “…Mars must have been at 18 Libra for Jesus death which is illogical and ridiculous” – just emotion… Why not? 3) “There is no way the Star of Bethlehem could have been Regulus because this was not an unusual event, it was always there.” – This statement has nothing with the context. All heaven objects are always there If you know what the star of Bethlehem is and that it should not be always there, you are really blessed)) The Evangelists calls this object “star” So, we have all rights trust them It was a star. Regulus is always there, but it is not always in the East and in conjunction with the Moon in the same time. Position of another royal star Aldebaran at the same time on MC make this scenario more unique. Finally, there is star playing the Star of Bethlehem role in last appearance (exactly at birth time) – Southern Scales. It has unique astrological meaning – native immortal name. This star is REAL Star of Bethlehem, because the role of regulus expires in Jerusalem. 4) “…it would not be visible to the three Kings or to anyone else.” Who told you, that story on “visibility” should be considered literally? Magi as astrologers worked with calculations. Not with “eyes” This Gospel story is written to people with no academic astronomy background. So, the story has real historical basis, but written in format understandable to ordinary not-educated folks. 5) “nothing in any of these charts that symbolically chime with the life and personality of Jesus.” – Just your opinion without any proof. This chart reflects christian sacred history and fate of Jesus. I write on this pretty much in detail. No evidence to suggest the Emperor was in attendance for Jesus death. Bible indicates that Pilate was not interested in him and only sanctioned it as a sop to the local churches. The shepherds saw the star as well which would have been impossible if it was Regulus conjunct the Sun. The Star had to be a phenomenal that was not always there. Jupiter / Saturn conjunction would be the obvious one.